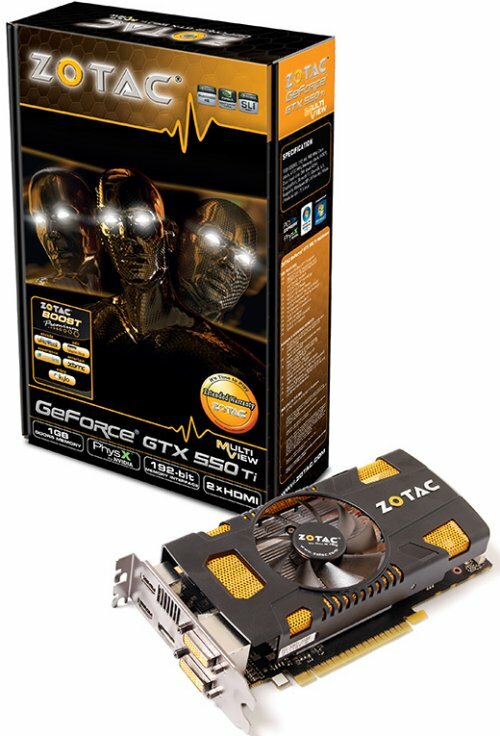 Zotac introduced the GeForce GTX 550 Ti Multiview, a new graphics card with triple-display capability. ZOTAC® International, a leading innovator and the world’s largest channel manufacturer of graphics cards, motherboards and mini-PCs, today expands the GeForce® Multiview line-up with the addition of the ZOTAC® GeForce® GTX 550 Ti Multiview. The ZOTAC® GeForce® GTX 550 Ti Multiview is the latest mainstream graphics card capable of delivering a seamless triple-display computing experience. The ZOTAC® GeForce® GTX 550 Ti Multiview is powered by the latest NVIDIA® GeForce® GTX 550 Ti graphics processor with 192 lightning-fast unified shaders paired with 1GB of DDR5 memory. The combination enables users to experience stunning visual quality while maintaining class-leading performance-per-watt with the ZOTAC® GeForce® GTX 550 Ti Multiview. It’s time to play with triple displays and the ZOTAC® GeForce® GTX 550 Ti Multiview.